Bouvignes-sur-Meuse (in Walloon Bovegne) is an old town opposite Dinant on the River Meuse, in the province of Namur in Belgium. 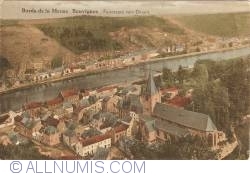 In municipal terms, the commune was merged with Dinant in 1965. Either it or Dinant was the birthplace of the first specialist landscape painter, Joachim Patinir (d. 1524).